Heartbreak Hotel was a cute story. 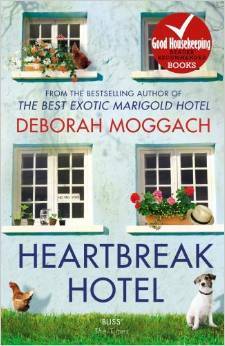 Though I have never read anything by Deborah Moggach I have heard of her and her excellent writing skills. This was a well written story about a B&B that brings some lost people together. I really wanted to like this book but I just could not get into it! I'm thinking maybe it was a little too mature for me because the characters are a lot older than I'm used to reading about. Buffy is seventy years old, I'm used to reading books about young adults or people in their thirties tops but not seventies. It made it very dull to me and it was very difficult for me to finish it. It felt like it took forever just for me to get to fifty pages and even longer to get to a hundred. Amy's story was boring and odd. Her relationship is failing and instead of focusing more on that it was focused more on her thoughts. She wasn't that great of a character either, I found her quite annoying. I don't see how she could be even slightly shocked that her boyfriend dumped her, she was so awful. She only cared about herself and her job. I thought it went a little too deep into the back stories of each character or maybe there were too many characters. Or both. I felt like I was weeding through useless knowledge too often. There was so much non essential information throughout this entire book that it took away from the storyline. All the characters had things I didn't like about them and some didn't have anything that I liked at all. I was disappointed that everyone's stories didn't really have an ending. I got so emotionally involved that I wanted to know what happened to everyone.